An April 7 Bloomberg News survey indicated that oil prices may rise on speculation that elections in Nigeria will curb output and the Libyan conflict will halt exports. Indeed, many new sources have cited market concerns over oil supply disruptions due to the unrest in Middle East, war in Libya have caused the market to price in ‘additional risks premium’ in oil. Nevertheless, the current market snapshot (to be discussed below) remains in total contradiction to the oil bulls' assertion that both WTI and Brent (front month for the next 30 days) sitting at 2+ years high … and climbing, are driven by these aforementioned "market fundamentals." Based on the latest data released by the U.S. EIA (Energy Information Administration), U.S. crude oil inventories rose by 2 million barrels in the week ending April 1, reaching 357.7 million barrels. Supplies have risen in 10 of the past 11 weeks. Gasoline stockpiles, although dropping for the sixth week out the past seven to 216.7 million barrels, remain in the upper limit of the average range for this time of year. Since ICE is essentially unregulated and there’s no regular inventory report on Brent and offshore oil storage tankers, we can’t really account for how many barrels could be sitting in Europe, and/or floating offshore somewhere. On the demand side, there are signs of demand destruction manifesting amid high oil prices. 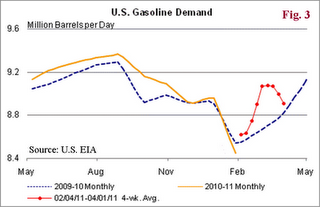 In the same data release for week ending April 1, the EIA also said demand for motor gasoline (Fig. 3), averaging 8.9 million barrels per day (bpd), is down 1.2% year over year, and is now at 8-year low, while the national average price of retail unleaded gasoline reached $3.684 per gallon on April 1, up 30% from a year ago. 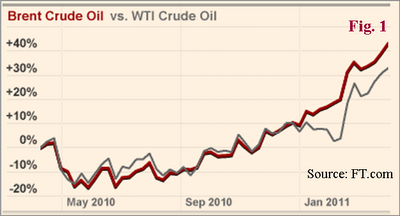 As mentioned earlier that there’s not a regular inventory report on Brent. However, there are other data points suggesting ample supplies of crude and oil products, along with signs of demand destruction in Europe as well. Bloomberg on April 7 quoted PJK International BV, a Netherlands-based consultant, that gasoil stockpiles in independent storage in Europe’s oil-trading hub rose to a three-month high, boosted by imports, and a lack of demand from the agricultural sector, while gasoline inventories also gained. So, the widely cited "tight Brent market" by oil bulls justifying the current Brent price above $126 a barrel, seems to have become a lot looser. Another highly touted bullish oil factor -- robust demand from China -- is also turning to be the light drizzle after a few loud thunder roars. China is facing an escalating inflation and just raised retail gasoline and diesel prices by 5-5.5% to new record highs amid high oil prices effectively Thursday, April 7. It marks the second time this year China has raised prices and the largest nominal increase in the past year. But this new price increase falls well short of a 20% rise in Brent crude since the last fuel prices increase of around 4% on Feb. 20. 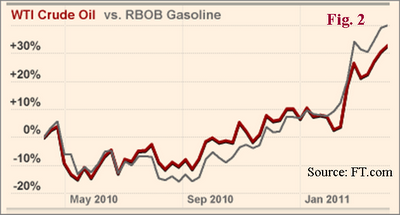 The fuel hike also came just a day after China increased benchmark interest rates for the fourth time since October. Market speculation is that March inflation number, due out the week of April 11, could be higher than expected. China has been working hard to tame an escalating inflation, and so far Beijing is not wining that battle. So we should see more tightening and more fuel price increases, which will curb growth along with oil and fuel demand. Regarding Nigeria, EIA estimates Nigeria’s nameplate oil production capacity to have been around 2.9 million bpd at the end of 2009, but as a result of increasing attacks on oil infrastructure since 2005, monthly crude oil production ranged between 1.6 million bpd and 2.0 million bpd. Again, similar to Libya, the production level is fairly small on the global scale. And since over 95% of the export earnings, and 65% of the Nigerian government revenue is dependent on the oil sector, according to the IMF, the country is unlikely to halt oil exports. Moreover, the political conflict in the country is nothing new and has been ongoing for the last 20 years or so. As such, the risk premium has already been well priced in, and should not be as big a factor in the recent price movement of crude. Another major supply concern is the war in Libya. The fear pertaining to oil supply is mostly a red herring as Libya rebels are busy making oil deal, and already shipped their first tank of 550,000 barrels of oil through the Egypt’s Suez Canal. Realistically, regardless who’s in power in Libya or Nigeria — rebels or the incumbent rulers -- oil will be made available as it is the single most important revenue source of these oil exporting countries. Further debunking the Libya "light sweet supply crisis," Saudi Arabia has come up with new light sweet blends for European refiners and pledged to make up for any shortfall from Libya. Platts Energy reported that Saudi Arabia has been offering two new "special" blends of crude oil similar in quality to the light sweet Libyan supply lost. The new blends, flagged by Saudi oil minister Ali Naimi, have API densities and sulfur content similar to some of the lost Libyan barrels. Nigeria crude is of the similar grade as the Libyan crude. So, if Nigeria completely halts export, which is a BIG IF, these two new blends from Saudi will be able to replace any lost barrels from Nigeria as well. There is also the argument that the weak dollar has acted as a culprit pushing up oil price. Granted that crude oil, like many commodities, is priced in oil, a sliding dollar does in turn inflate the price of oil in dollar sense. However, as the comparison chart (Fig. 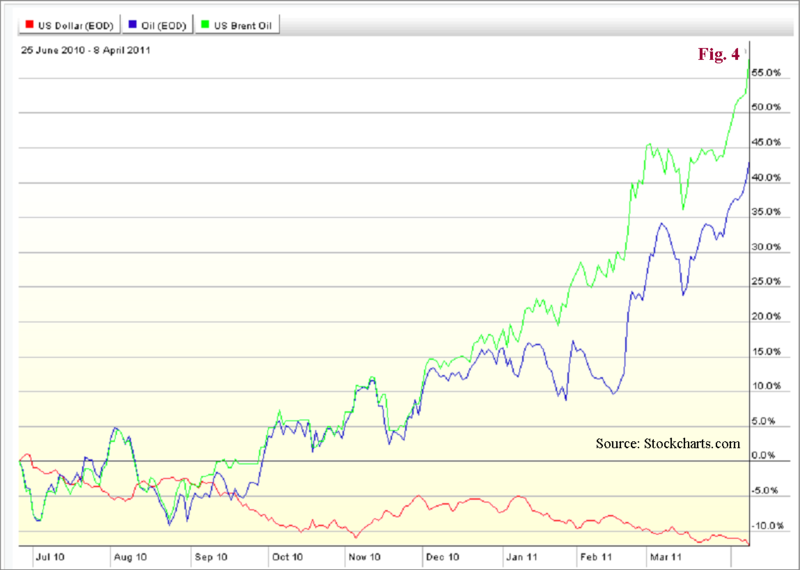 4) illustrates, the ascend of WTI and Brent (using BNO, an ETF tracking Brent) has far outpaced the decline of the U.S. dollar index (DXY) by 300-400%! The U.S. dollar has been on a steady decline in the past decade, so, again, the dollar is just a convenient excuse to justify the oil market movement. The discussion so far has demonstrated that "Peak Oil" and the "Libya-Nigeria to Global Oil Crises" are unlikely to materialize in the next 30 days. 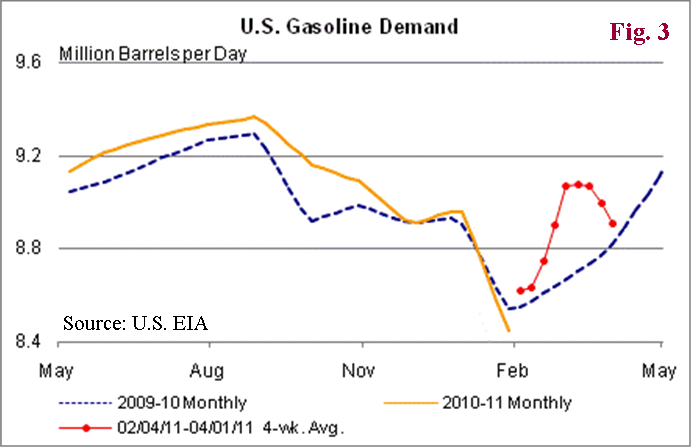 What is materializing is a demand destruction evidenced by an 8-year low gasoline demand in the U.S., and decreasing gasoil demand in Europe. The once robust Chinese demand could see a significant pullback as Beijing most likely would need to raise fuel prices and use other tightening measures in a bid to fight inflation. Bottom Line - Do these "oil urban myths" truly support and justify the current oil and gasoline "risk-premium" price levels? Market facts and fundamentals clearly disagree. Although I’ve debunked some of the popular myths about crude oil, with supporting data that the fundamentals are far more bearish than the current market sentiment and price levels suggest, we are still left with searching for the real reasons behind high oil price. For that, a good starting point would be to look under the rock of QE2-fueled speculation. Unfortunately, it is ingrained into human DNA that we seem to be always fascinated with urban myths. The herd mentality and QE2-fed market high are likely to drive something that should be priced at around $90 a barrel to $125 or even $150. As the artificially inflated bubble eventually deflates, the crude market would see the same boom and bust cycle only a short three years later. On that note, crude oil would be vulnerable to a sharp correction as market fundamentals eventually take over, particularly after the QE2 ends in June, if not earlier. As crude oil prices are testing world's price tolerance threshold each day, it would be a good time to take profits from some of the resource related investments in your portfolio. That would include oil commodity ETFs like United States Oil Fund (NYSEARCA:USO), Untied States Brent Oil Fund (NYSEARCA:BNO); producers such as Exxon Mobil (NYSE:XOM), Chevron (NYSE:CVX), Conoco Phillips (NYSE:COP), Apache (NYSE:APA), Valero (NYSE:VLO); oil services companies like Schlumberger (NYSE:SLB), Halliburton (NYSE:HAL); oil service ETFs such as PowerShares Oil and Gas Services Portfolio (NYSEARCA:PXJ), Oil Services HOLDRs (NYSEARCA:OIH). In addition, since energy makes up a good portion of S&P 500, I would expect a sizable pullback on the large cap index related investments such as Vanguard 500 Index Fund Investor (VFINX) as well.